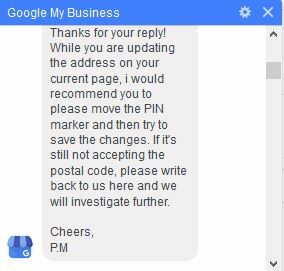 If you are dealing with changing/adding an address on your Google My Business location. From time to time you may encounter an issue that deals with the actual proper address. Recently an issue with a Postal Code came up with a client. The address was correct. Double checked with Canada Post for the proper postal code. All was good. Once you have the proper address details, input the data and then submit in Google My Business. If you are getting the invalid input error as seen below. The recommended option is to move the PIN marker on the map and then try to save the changes. If it’s still not accepting the postal code, you will need to contact Google My Business Support. You can reach them via one of the channels below and they will need to investigate further. Here’s the actual correspondence with Google My Business Support regarding this exact issue and their response. Note that the changes to the address may not be instant and may require Google to review the changes. If there still are issues after that, you will need to contact Google Support.